We’d love your help. 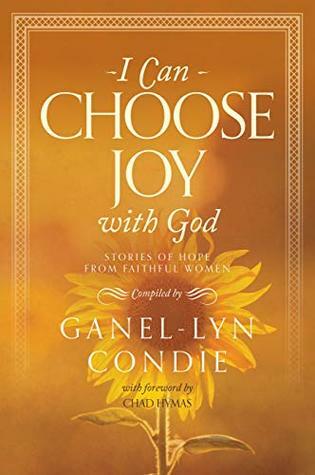 Let us know what’s wrong with this preview of I Can Choose Joy with God by Ganel-Lyn Condie. To ask other readers questions about I Can Choose Joy with God, please sign up. I find that when I am struggling with a concept or need to learn more about a principle, I am attracted to a certain word. The word that I am finding over and over is joy. This past General Conference I was writing down the things that stood out to me, I was thinking of it as my personal revelation journal. The word that I wrote more than any other is joy. I even recently purchased a shirt that says "choose joy." That means that this was the perfect book for me at this time. This book is written I find that when I am struggling with a concept or need to learn more about a principle, I am attracted to a certain word. The word that I am finding over and over is joy. This past General Conference I was writing down the things that stood out to me, I was thinking of it as my personal revelation journal. The word that I wrote more than any other is joy. I even recently purchased a shirt that says "choose joy." That means that this was the perfect book for me at this time. The book is divided up into 5 sections, Gifts, Marriage, Health, Family and Mission. I really liked the way I learned a little bit more about Heavenly Father and my relationship to Him by reading some of these sections. I’d never th I love the way Ganel-Lyn Condie writes! Her books are full of amazing stories from people that have dealt with hard things. These people all have something good to teach the reader. I only hope that I was wise enough to have learned something from some of the stories. I enjoyed reading about the various women in these stories. Each of them are members of the Church of Jesus Christ of Latter-day Saints but they all have different life experiences and problems. It was interesting to see how they faced their trials and seek joy with God. The stories were inspiring and uplifting. It was easy to pick up and read a story or two at a time. Please note that I received a free copy however my opinions remain my own.